Haven't Gone to Court Yet? A 100% online theft class for adults or juveniles - only $50 for our 4 hour class and only $65 for our 8 hour shoplifting classes . Complete at your own pace, any time, start-stop-start again at whenever you want, 24 hours a day -7 days a week, from the privacy of your own home! No groups, no classrooms, no confessions - all from the privacy of your home. Nothing to download; when we say online shoplifting class, we mean 100% online. Court approved - Guaranteed! Sign up now! 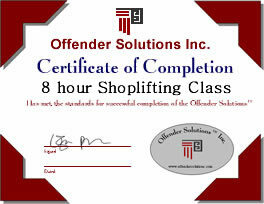 Our online shoplifting class is administered through the nationwide leader, Offender Solutions®. Our online shoplifting / theft class has not only served clients in every state, but also throughout europe, Australia, canada and many other free countries. The Offender Solutions® online theft class is a convenient way to complete a court, school or diversion required program! The Offender Solutions® online theft / shoplifting program is dependable, qualified, efficient and reliable. We meet the National Center for the Study of Theft Behaviors high quality standards and have an A rating with the Better Business Bureau. Better Business Bureau: Due to cost, Offender Solutions® is no long a member of BBB, however, our "A" rating record is available - HERE. We offer an 8 hour adult theft class and a 7 hour juvenile theft class. Online class also available in spanish. Spanish Class: (en español) . Or, we also offer a correspondence workbook (through the mail) for adults, juveniles and in spanish formats. Because of printing and mailing costs, our workbook class costs $75. You can purchase the workbook class by clicking here. Your No-Cost Completion Certificate will be Immediately available upon completion of your theft/shoplifting class! Each chapter is activated upon completion of the previous one. Once the final exam has been completed the Certificate of Completion is activated and available for you to print. Or, if you want us to fax your certificate or an embossed Certificate mailed, no problem, no charge- just ask! Be careful, others charge a Certificate embossing fee and/or a "Report" fee. We have no added fees! Your free certificate of completion is immediately available upon completion of your class. Some "online" programs offer "downloadable" documents for you to print out. Some "online" programs require phone calls, mailings or e-mail going back and forth - not our! 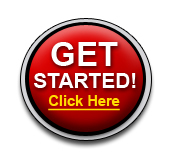 Our ONLINE program is 100% ONLINE! No computer? Prefer reading out of a workbook? No Problem! Our workbook correspondence program is made for you! Available in English and in Spanish. To sign up for our workbook program - click here.